Easterseals celebrates 100 years of impact in the lives of individuals with disabilities or other special needs, their families and communities throughout America as a powerful advocate and leading provider of innovative services. In marking this milestone, Easterseals reflects on its legacy of delivering equality, dignity and independence to people with disabilities while embracing a future where every one of us is 100% included and 100% empowered. Your participation in an Easterseals event can help change lives. Whether it is joining a walk, buying a raffle ticket, or entering a tournament - there are a number of ways for you to support people with disabilities and special needs in your community. 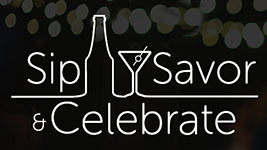 Learn more and purchase tickets for Sip and Savor 2019. Easterseals will be celebrating 100 years of impact in the lives of individuals with disabilities or other special needs, their families and communities throughout America as a powerful advocate and leading provider of innovative services! Register and Make a Donaton Today! Check out the recap from our 2018 Strides run/walk family event!